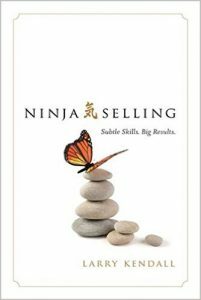 We at The Group Real Estate in Idaho Falls Idaho study a book called Ninja Selling. I have finished reading the book but it is going to take me time to put they systems and principles it teaches into effect. That is just the reason for the book. Most real estate agents are what we consider an on-accident Realtor. In the book it teaches you to not be an on-accident Realtor but an on-purpose Realtor. They way that an on-accident Realtor becomes an on-purpose Realtor is by putting systems in place that are done every day. I recently wrote a blog about life’s big moments and how people in general tend to focus on those big moments as apposed to the thousands of little moments of everyday life. If I could look at a parallel to this in real estate sales. the big moment is the closing of a home resulting in a payday, which is the point for most agents. But how did we get to the all important closing table? Most agents just rely on luck, or only word of mouth. Don’t get me wrong there are agents that have been successful doing that but it is simply not reliable and most certainly can not be tracked. Ninja selling outlines small life changes that are done every day. The great thing about this is that over time, these small changes cause the big results. I am not going to go into crazy specifics you will have to read the book for that but here are some examples to wet your whistle. Changing from your current mind set to the mindset of a Ninja. People are negative by nature. A lot of times people focus on negative aspects of life so much that is causes them to become depressed. What you focus on expands. So why not wake up every morning and before you reach for your phone to look at your emails or scroll through Facebook. Reach for a pen and paper and write down two things you are thankful for. Remember what you focus on expands. If you start your day off with writing. “I am thankful for ………” You have just started you day on a positive note. Then try and expand on it. Read a couple chapters of a book that is inspiring. Like the Ninja sales book. Now you have started to expand the positive, because why? What you focus on expands. This continues on to your daily tasks. The book also has great insight on asking questions that will help you become a Realtor that is not focusing on the 1 closing then hoping for the next but putting a system in place with information gathered from those questions to create a pipeline of closings that become track-able. Putting together a list of people that you have done business with. That you are doing business with. That you will be doing business with in the future if you are focusing on staying at the top of their mind. I really like a quote from another book called the little red book of sales. The quote is as follows. “All things being equal people do business with their friends, all things being unequal people still do business with their friends.” This is a great quote however in real estate there is another leg to it. What if your friends have other friends that are real estate agents. What sets you apart in that case. I will tell you because it is very easy if you just apply it. Systems that keep you at the front of their mind. To find those systems please go look up the ninja sales book. I am a Ninja. I enjoy being a Ninja. I also enjoy helping others become Ninjas. Ninja Selling subtle skills. Big results by Larry Kendall.